Economic order quantity (EOQ) concerns the most cost-efficient method of ordering stock. The objective is to reduce stock costs to a minimum in order to retain maximum profitability. Large amounts of stock increase holding costs, while large quantity orders tend to reduce purchase and delivery costs. There is a point of balance at which the total cost of stock reaches an optimum level, and this is the economic order quantity. Finding and maintaining EOQ would be relatively simple in an environment where demand for each item and the cost per item were constant. However, for a warehouse distribution operation, this involves taking into account factors such as the cost of the items ordered, delivery costs, available bulk discounts and warehousing costs to ascertain the optimum order size and frequency. Accurate EOQ purchasing can help a warehouse run smoother and more lean by ensuring high standards of customer service while reducing overall stock costs. This is most prominently seen in a business environment such as wholesale distribution where profit margins are tight. EOQ procurement helps with stock optimisation by ensuring that items are only ordered when required. Less frequent orders will ensure a good turnover of existing stock, helping to free up capital and ensure profitability. Industries such as medical technology have a pretty constant and predictable demand. This makes EOQ easier than in other industries such as construction supplies, where there is usually an increase in demand during the summer months when new residential and commercial building is at its highest peak. To more effectively manage impacts of seasonality on EOQ for a wide variety of products, more predictive measures and forecasts need to be put in place. 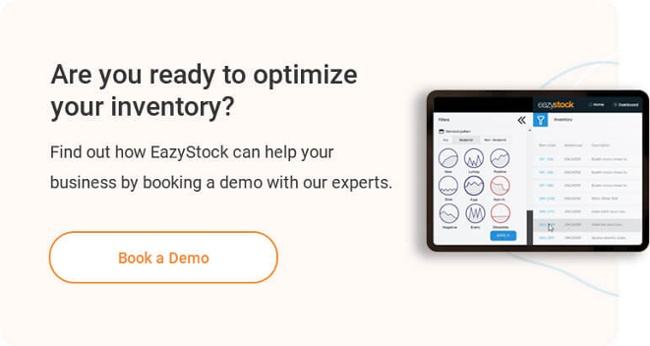 Advanced demand forecasting modules like EazyStock extend common forecasts from inventory management systems to help calculate a smarter EOQ. Seasonal changes in demand are also a factor within single industries: in the wholesale supply of HVAC systems, there will be reduction in demand for air conditioning systems during the winter months and a rise in demand for heating equipment. Accurate EOQ procurement involves managing these variations effectively and liquidating stocked items that are losing demand while increasing stocked items with rising demand. Demand for different products will tend to wax and wane: as new trends emerge in the market, distributors will introduce new products and older declining products will have a reduced demand. Overstocking older products can lead to obsolescence, which overtime increases unnecessary carrying costs and leads to diminishing returns and profits for the business. On the new product introduction front, as certain items gain in popularity, there may be a sudden upswing in demand. At EazyStock we call these swings “fliers” in demand forecasting data as they maybe a large 1 off order or it could be erratic spikes in demand due to unforeseen circumstances. The challenge here is to order ahead of the demand: waiting until there is demand before stocking items will result in lost business and stock outages. Inventory forecasting is an essential part of ascertaining EOQ and tools like safety stock management can help distributors keep enough inventory on hand to keep customers satisfied. Without real-time information on stocking levels, EOQ is impossible to determine. A smart inventory management system is necessary to ensure that items of stock are moved to where they are needed without unnecessary reordering. At EazyStock, we call this process redistribution. The information supplied by these systems can give a clear insight into seasonal variations and changes in customer demand for each item, enabling ABC analysis and facilitating optimum order sizes. Learn more about how ABC Analysis works by clicking here. Click to download the white paper. Ensuring that stock is always in circulation will ensure inventory optimisation and reduce holding costs, and this will help to determine the most efficient reorder point when requesting new stock. Knowing the ideal reorder point for items will lead to a reduction in the total cost of stock while maintaining high levels of customer satisfaction. In order for your company to perform at its peak levels of service while maintaining a low overhead, your company should be optimizing its warehouse stock locations. One way to maximise profitability is by strategically arranging the warehouse so that fast-moving items are located near the shipping area while obsolete stock is in the back. Another is by more accurately forecasting trends and seasonality for the items being stocked. Most traditional inventory management systems do not have the capabilities to optimise these metrics for distributors, so they have to calculate them manually via Excel or utilise inventory optimisation software. Yet another step towards warehouse optimisation is by setting up automatic reordering points so that you never have to worry about missing a customer order ever again. These are all facets of EOQ, and all of these management functions can be easily managed in a cloud-based Inventory Optimisation Software called EazyStock. By implementing EazyStock with your current ERP or inventory management system, you can more accurately calculate EOQ metrics for every item carried in stock. Customers who use EazyStock have reported higher customer satisfaction and higher profitability within months of adding EazyStock to their operations. Learn more about how EazyStock can help your business by requesting a free demo!